The goal of Les Petits Caméléons Curieux is to create an immersive workshop in Chinese, bringing rich content and activities to the children in the workshop. Les Petits Caméléons Curieux's original intention is to help children to discover and understand different cultures and languages through various art forms; to let children play and learn in school through rich activities, without stress; to accompany children to develop ability to deal with integrated information through practical activities, ability to communicate and express, ability to solve problems, ability to operate, and ability to cooperate with others; to enhance self-confidence, cultivate empathy, and patience; and most importantly to let children feel love and to love. This year we organized a Halloween event on the last Wednesday before the Halloween, and the teachers and children of the Les Petits Caméléons Curieux workshop had a fulfilling and exciting day! Parents and children have worked together to complete several tasks and cooperate with each other very efficiently! The teacher and the children started from 9:15 in the morning and prepared various items for the afternoon activities one by one. After the event started, the children quickly started a variety of cute handcrafts. Let’s see what they did together! Witch hat: It is very convenient to make witch hats. The children who can use scissors cut the paper with a little hardness into two concentric circles. The younger children then help put the small hat and small circle stick with plastic bags. Finally, a witch's hat is ready. Cute little spiders: The children use a few soft wires to entangle the hair balls, the colors can be arbitrarily matched, and the little spiders of different shapes will be displayed in front of everyone. Multicolored Spider Web: The art manual teacher demonstrates the practice for the children. The children carefully imitate, and the spider web made by the teacher is almost the same as the teacher! They said that the spiders' homes are ready! Little paper pumpkin: The paper pumpkin looks very difficult to create, but after the art manual teacher reveals the secret, the children have folded out a small pumpkin and love it. Witch's home: A big pumpkin next to the gingerbread house and a special effect soundtrack for Halloween, the witch came out of the house! Children practiced Chinese language while they were doing the handcrafts with teachers. Not only were the items ready, but they also took a Chinese class vividly. It is easy to speak Chinese, play in the school, and learn while play is the purpose of our fun workshop and the initial goal of our teachers. "Children! Now we have to prepare cakes and cookies. Who wants to participate?" "Me! Me!" The children rushed to sign up. The little chefs turned around and they completed their work independently according to the steps told by the teacher. They looked serious and focused. People who say that they work hard are the most attractive. I say that children who work hard are more attractive, so that you are not willing to take your eyes off from them. In practice teaching, I found that making food makes the child feel more alive. Through the five senses of sight, hearing, smell, touch and taste, the child's memory of Chinese can be deepened. The five senses experience is the teaching method used by our workshop. At the same time, I also found that children are passionate about making food. Is this a "side effect" of the fun workshop? The children will say, "I want to make a cake for my father. I want to make one for mum. I love Dad and Mum, so I'd like to create something for them." Moreover, they also make some creative food from time to time. For example, in the Halloween-themed food creative session, I suddenly saw a child who made a duckling (it was confirmed that the duck was made by my son). Obviously, children's creativity can't be suppressed. They are happy to be free to play and create. During our activities, I was always surprised by their creativity. 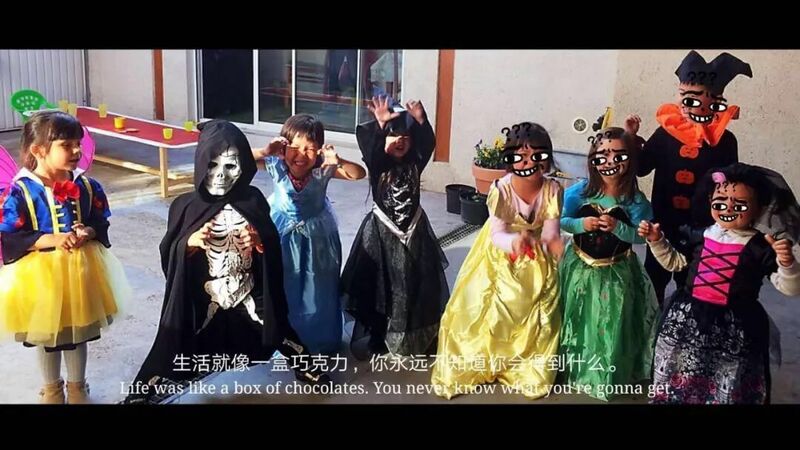 Children made the beautiful “skull mask”, “big mouth monster” and learned how to say “Saint, Festival, South, Pumpkin and Female” during making a Halloween Chinese greeting card. Of course, we also tasted the cakes and biscuits made by ourselves. Everyone says "very delicious!" At the end of the event, children changed their costume! Play the most classic and exciting game of Halloween, play the ghost! The nearly two-hour event was quickly over, and there were not only children, but the adults also talked and laughed. Parents are also very happy to participate with children and happy to enjoy with teachers. It is very interesting to combine activities, cultural experiences and education. After the event, I recorded the process and content for future work. Looking at these photos and thinking about the activities, I feel that I am doing a right thing. We live overseas, and children become different in the living environment because of us. They hear at least two languages at home, the opportunities and time for each language are reduced. How to create a Chinese environment for children and how to encourage them to speak Chinese fluently is my current work direction, then the Petits Caméléons Curieux workshop is the best place to make it true. I hope that this small workshop can plant the seeds of Chinese in children’s mind and open the door for them to explore and understand Chinese culture.